Argentina's veterans are predicting a bright future for the nation's rugby team when the Pumas join an expanded Tri-Nations next year. Argentina are counting on a perfect game, and a little luck, to have a chance of upsetting New Zealand in their RWC quarter-finals. The All Blacks' quarter-final rivals Argentina say the haka is an integral part of playing New Zealand and should be enjoyed as such. Cheetahs defence coach Michael Horak says Argentina have the best defence at the RWC, while the Springboks' could improve more. Argentina are waiting on a last minute fitness test for ironman Rodrigo Roncero before announcing their team to play New Zealand. All Blacks captain Richie McCaw will lead his team out against Argentina, despite carrying a foot injury into the quarter-final. Argentina set up a World Cup quarter-final against the All Blacks after grinding out a 25-7 win over Georgia on Sunday. Argentina have kept their quarter-final hopes alive with a narrow victory over Scotland in a pulsating RWC clash in Wellington. Argentine prop Martin Scelzo has warned New Zealand not to underestimate his team ahead of their RWC quarter-final clash. Argentina hold most of the aces in their clash with Georgia as rivals England and Scotland having fought it out the day before. 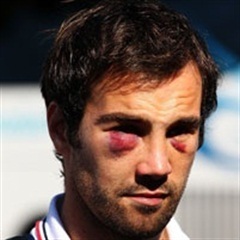 Argentina vice captain Juan Martin Fernandez Lobbe has been ruled out of RWC with knee injury he sustained in the win against Scotland. 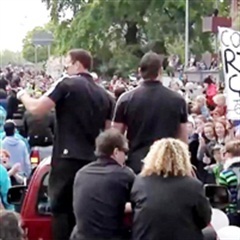 New Zealand, despite the injury to talisman flyhalf Dan Carter, are still favourites to win the 2011 Rugby World Cup. Argentina have made five changes to the side which beat Scotland when they take on Georgia in their final RWC pool match. Felipe Contepomi will start at inside centre for Argentina in their crunch World Cup Pool B match against Scotland. 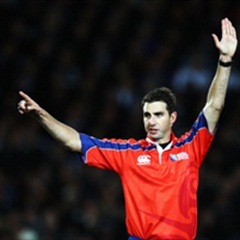 Video: Did Joubert get it wrong? The All Blacks are a mighty force and this Rugby World Cup may well be the one where they shake the ghosts of past tournaments. Wallabies flyhalf Quade Cooper is arguably the most flamboyant, talented and mercurial rugby player to represent the Australian team in recent years. Eden Park's history boasts some of the greatest sporting moments, including the inaugural Rugby World Cup in 1987 and 1992 Cricket World Cup. Nike released a new commercial following Tiger Woods' 15th Major victory at the Masters tournament in Augusta National Golf Club. British singer Robbie Williams, who was the opening act at the Soccer World Cup in Russia, decided to flip his middle finger to the camera. Nemanja Vidic speaks openly about his prolific defensive partnership with Rio Ferdinand during their time at Manchester United. Internet sensation Ho-Sung Choi took on Erik van Rooyen in the first edition of series 2 of the European Tour’s 14 Club Challenge in Kenya. Relive the controversial 2018 Australian cricket tour to South Africa, which rocked the game and resulted in various consequences. Twitter is abuzz after the RWC elimination of the Springboks. Warming up before training or matches is one way to prevent injuries. Exactly what physical condition are the Springboks expected to be in? Explore the injury that has ruled Bakkies Botha out of the RWC. Listen to these songs to help you get behind the Springboks! The high tackle can cause serious neck and spinal damage.